When it comes to pouring or cutting out concrete for a flush-mount mid-rise lift or full-rise lift, you need to know the exactly proportions of the lift, so your cuts aren't too wide, narrow, deep or shallow. Generally speaking, and this is especially true if you're having an installation team install your car lift on-site, the concrete needs to be pre-cut. In some cases, it needs to be freshly poured. If any of this is done improperly, you may wind up paying for the installation team's time, plus the cost of the second attempt, plus the cost of re-cutting or pouring the concrete. Luckily, BendPak makes this process easy, so you can get it done right the first time. VERY IMPORTANT: This article is meant as a guideline, not a step-by-step tutorial. DO NOT use these steps to replace manual instructions, nor do they constitute specific directions for any lift in particular. However, this article is useful as a general guide and may help you prepare for the delivery and installation of your new BendPak flush-mount lift. Every mid-rise and full-rise lift user manual comes with instructions for concrete prep. Each lift is different, but there are a few basic steps to follow once you know the dimensions of the lift's platforms. You don't have to wait for the delivery of your lift to get the instructions for pouring or cutting concrete. The manual for the MDS series, for instance, is free for download online. We keep all our manuals updated to the latest versions, so you don't have to guess whether or not you're looking at the most recent version. Of course, if you ever have questions, please contact us immediately or send in a request for support. Check, double-check and triple-check your measurements. The numbers you get from a BendPak sales representative should be the same numbers you see online. 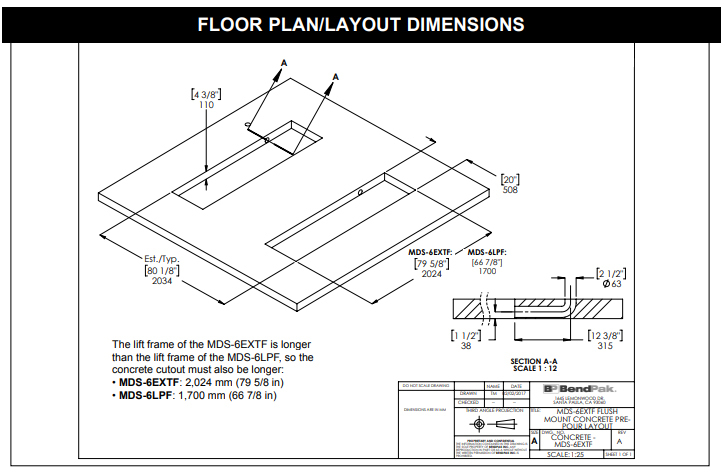 Example: The MDS-6LPF has frames that are 1,700 mm long and 484 mm wide. Therefore, we recommend pouring or cutting a concrete patch that is 1,725 mm long and 508 mm wide. We simply add 25 mm (about 1") to each dimension (still pouring 111 mm deep), so the lift platforms fit comfortably in the sub-surface cutout. This also leaves ample room for any bolts or valves that will accompany some models. If you're cutting concrete, this step doesn't apply. After pouring fresh concrete, let it dry for a full 28-day cycle (or fewer if using a fast-drying compound like Quikrete™). DO NOT attempt to install a mid-rise lift in concrete that has not been properly cured and dried. A flush-mount lift is an extremely useful shop tool, as it gets out of the way when you're not using it, clearing up valuable floor space. Be sure to follow the specific manual for your lift. Do not use this article as anything more than a general guide. Follow all warning and safety labels that accompany your lift, and you're sure to be lifting with your BendPak for many years to come.